What if you suggested they use Sharp OSA technology to seamlessly integrate the Sharp MFP with their existing software? 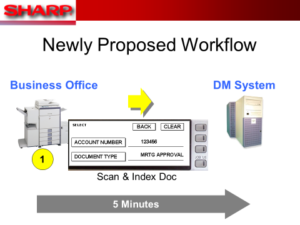 Imagine when renewal time came on their MFP fleet and their office workflow now “required” a Sharp MFP to function. Login to the Sharp Reseller website and click on Sharp OSA Technology. Example, scanning into a Document Management Software. In this example the document will scan directly into the client’s software and be filed using the required data. Likewise it can be recalled and printed from the MFP as well.